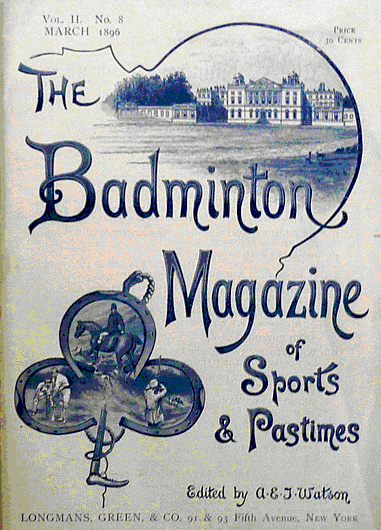 Taken from The Badminton Magazine, April 1906, page 447; digitised by Google. 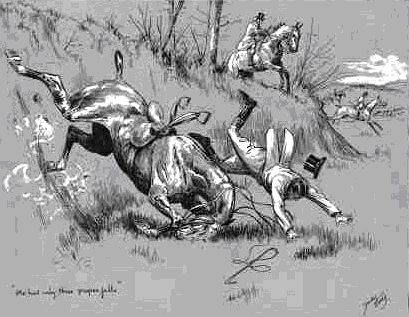 Though so many people write on the subject of riding and hunting, I have never seen any remarks on the art of falling; yet it is really quite necessary to learn how to fall, and it ought to be part of a hunting education. Having had a rather varied experience in falls, which must have averaged at least 250 in the first two seasons, and having never been seriously damaged, I think my methods must have some good qualities? One day when I was poaching on a neighbour’s bog I found a clump of white heather, and on the strength of this good luck asked my father (not for the first time!) to give me a hunter; when, to my intense delight, I was presented with the sum of 20 pounds. 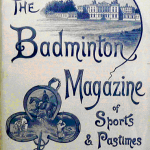 Needless to say I felt condescending to all millionaires, and an auction being advertised of horses, cobs, etc., I lost no time in inspecting them, and calmly marked my catalogue with animals that I fancied. 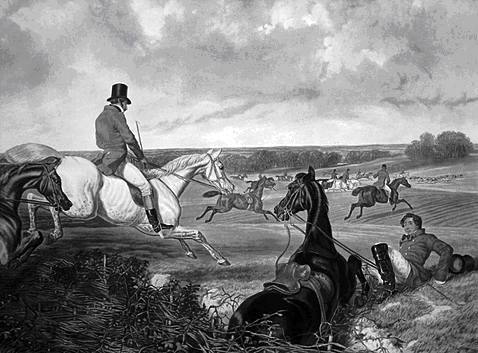 An unfortunate veterinary surgeon who laboured under the impression that I was an escaped lunatic followed me round, gently remonstrating that he could not possibly examine all the horses for me, and that his charge was 1 pound and 1 shilling; which mercenary remark made my friendship for him cool considerably. The animal, on inspection, proved to be a three-year-old grey mare, standing over on her fore legs, with a coat like a sheep and a mane like a doormat ; she was trembling all over with excitement, and looked as mad as a hatter. To make a long story short, I bought my first hunter. Incidentally I may say that three years afterwards she won first prize as a hack the only time I showed her, and one of the best judges in Ireland said she was the most beautifully-shaped mare he had ever seen. 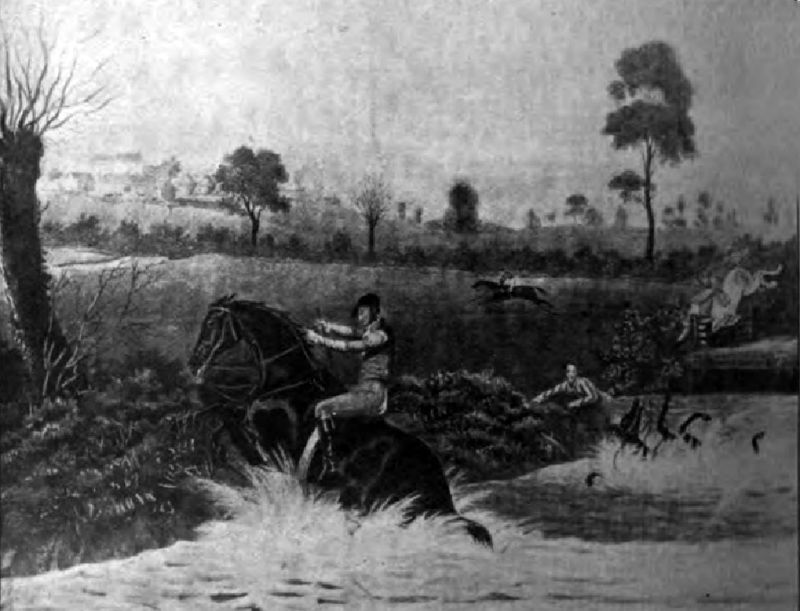 The only hounds within reach of me then were a certain pack of draghounds; the mare had not been schooled, neither had I, so we learnt the way not to jump together. 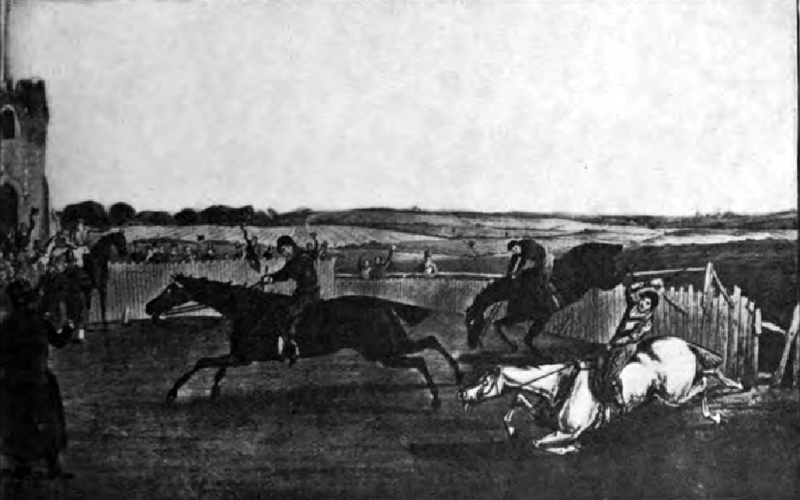 The hounds were fast, and needed all their speed to save their lives; and of course I rode full gallop at all the fences, with the natural result over a trappy country that we were frequently down, generally, I must say, on the right side to continue, and her wonderful speed made up for the few seconds lost in falling. For a long time I looked upon falling as part of the game. The riding, if peculiar, was exciting, four or five horses often being down in the same ditch in a struggling mass; but no one, as a rule, was damaged. 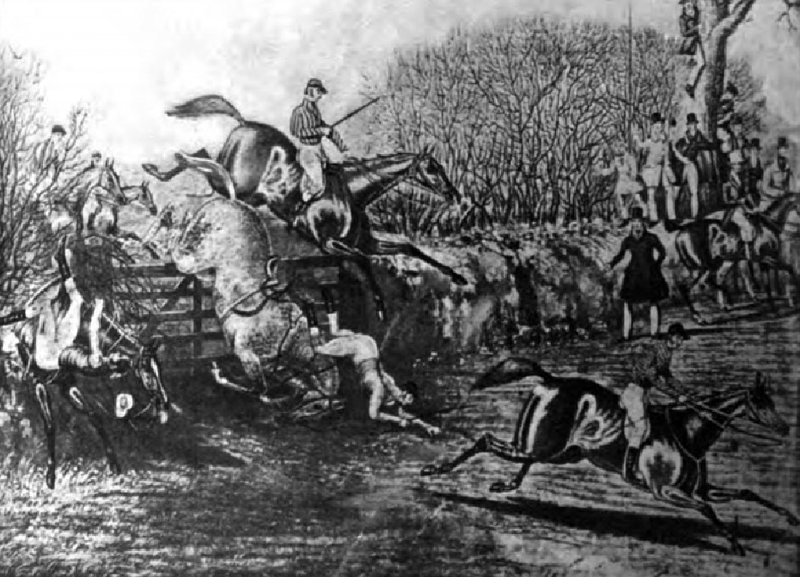 The riders held on to the back of their saddles, shot over the fences without giving their hunters time to follow; slipped backwards on to the ground in a sitting position when their steeds rose at a fence. 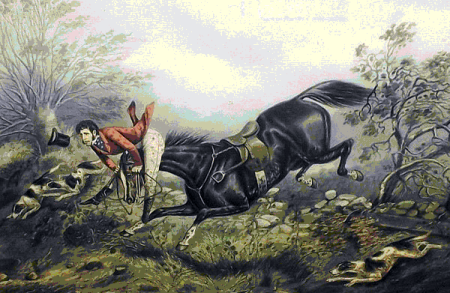 In fact, it was the quaintest hunt in creation; and I learnt to fall! There are many ways in which a horse may fall. 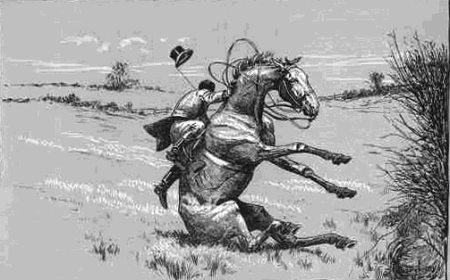 Generally the mistake is made on landing, and usually either because the horse has taken off too soon or too late. When horses blunder on to their heads or drop their hind legs in the ditch, the best plan, in my opinion, is to sit still. It is 10 to 1 you can pull them up, or they recover themselves. 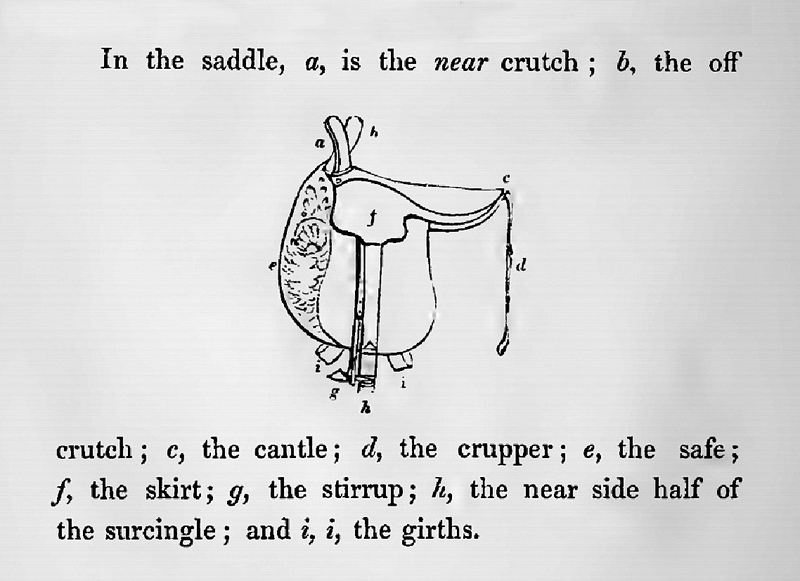 On the other hand the horse may roll back or roll over, and then is the time to slip out of the saddle when your foot touches the ground; if he rolls to the off side, slip over the off side also, and avoid his legs and the crutches . One can overdo the sitting still, but that is where judgement comes in. I stuck to the saddle one day when the mare fell into a ditch, but she got up in such a series of rolls and plunges that when she recovered her legs again I found myself hanging head downwards on the offside, with my foot caught in the stirrup. Fortunately I had hold of the reins, and kicked with great energy for some time before I got clear. 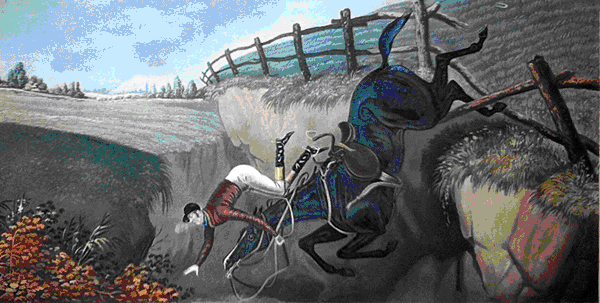 My advice to ladies when the horse falls is to sit still while you can, and if you must go, depart over the off side. You have the advantage of escaping the crutches and getting a clear fall. The method of doing it is thus: Put your head down on the off side, your right hand down the horse’s shoulder, swing your legs over and down, and you land on your feet with the reins in your left hand. 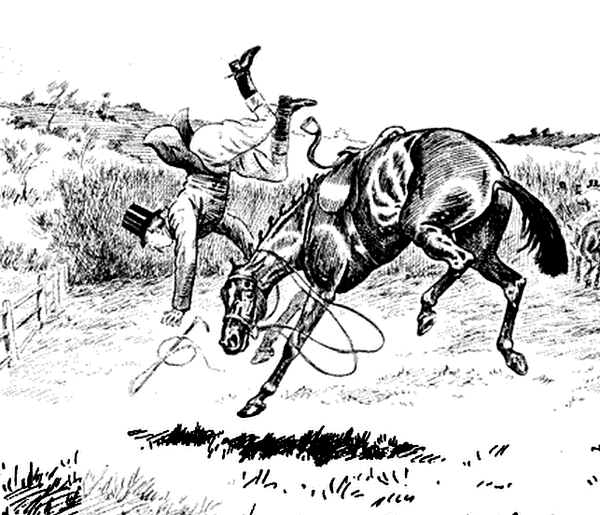 If a horse is turning a somersault, or in any mishap when he is falling over on to his head, it is very easy to do, as you merely go with the horse. 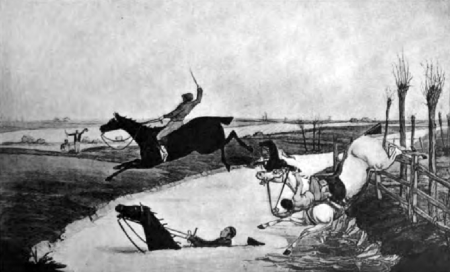 One of the secrets of good falling is to have your muscles perfectly slack, on the principles of the South American rough riders, who sit a bucker by balance, going easy with the motion of the bucks. My father, who was out there for some years, saw an Englishman trying to ride one of these buck-jumpers, striving to sit tight and grip, and he simply got his back broken in the saddle. One often sees “Fatal Hunting Accident” in the papers, which generally turns out to be someone riding a tired hunter home, on the ” ‘ard ‘igh road “; the horse stumbles, and the rider falls heavily on to his head, generally with the result of a broken neck; if he had learnt to fall, he would have come off easily on to his feet. 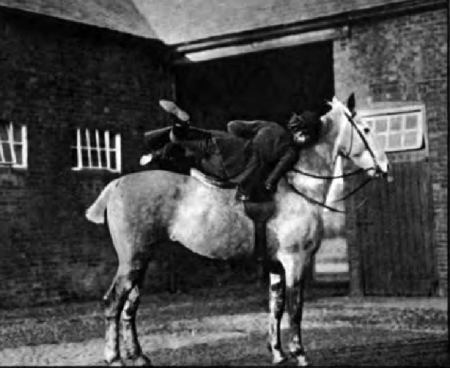 A side saddle is almost impossible to get out of when a horse is coming over backwards; but occasionally, if you leave his head alone and throw your weight forward, a horse may save himself by turning on his hind legs and coming down sideways. I remember a clever brown cob coming back with me over a slippery bank and ditch. Two horses had come down at it first, and my effort was perhaps rather half-hearted. The little chap got his forelegs over the bank and seemed to me ages struggling and slipping. I knew he would come over, but I could not get off; finally, just as he fell back, I managed with a wrench to fall to one side. After that we got up again and accomplished it safely; only, to my intense disgust, I shot clean over his head on landing. My feelings were somewhat mollified by finding an excuse in a badly-sprained riding muscle and a crutch straightened out like a poker; in fact, my numerous accidents were rather expensive, as I got one saddle broken four times. My little mare taught me to fall, but I spoilt her with the draghounds, and was never able to teach her wisdom over fences. She was absolutely careless, would never look where she was going, and seemed to enjoy falling. 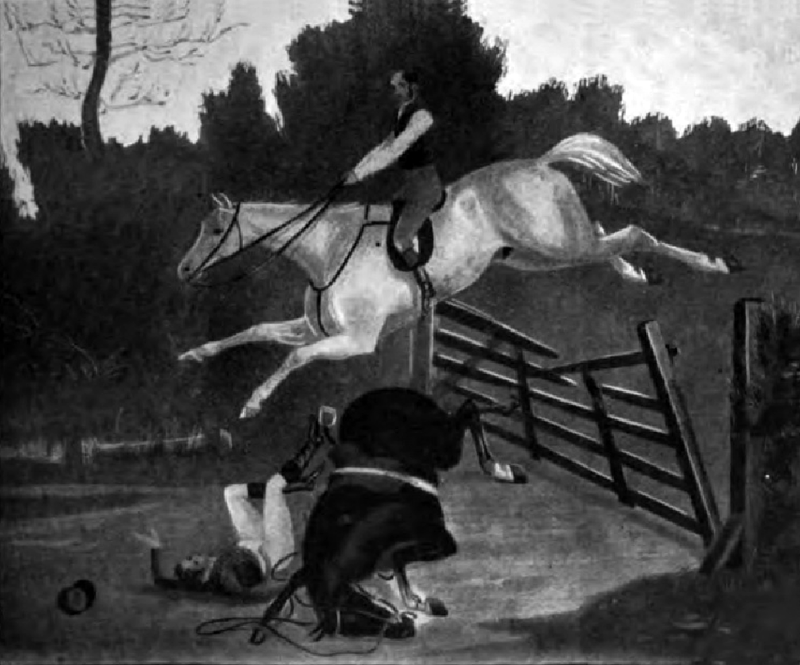 She invariably fell over timber that would not break, and one day we happened to be the first over a timber gap, the only jumpable place in the fence (hounds fortunately were not running). She turned a complete somersault so quickly that I had not time to get clear, and she lay on the top of me, of course blocking the way. The field behind thought I was killed, and it apparently did not enter their heads to scramble over on foot. Fortunately my head was free, so I managed to wriggle my arms out and get them round her neck. Then I began to kick her somewhat feebly in the ribs; however, it had the desired effect; she gave a fearful groan, and rolled partly up, and I pulled myself out a few inches more. 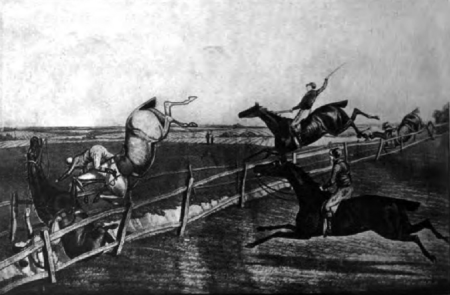 She fell back again, which process was repeated three times until we both struggled up together, and as long as I live the expressions on the row of horrified faces staring at my resurrection from the other side of the fence will make me laugh. The mare was staked to the bone on her forearm, and we retreated to the nearest farmhouse, where I was able to get some carbolic. Unfortunately, while I was cleaning the wound, ‘herself’ rose up, knocked the front teeth out of the man who was holding her, and tried to eat a doctor who offered to sew her up! We had ten miles to limp home, and top boots are not comfortable to walk in. Another fall that remains ever green in my memory happened while jumping a rotten bank in Queen’s Co . 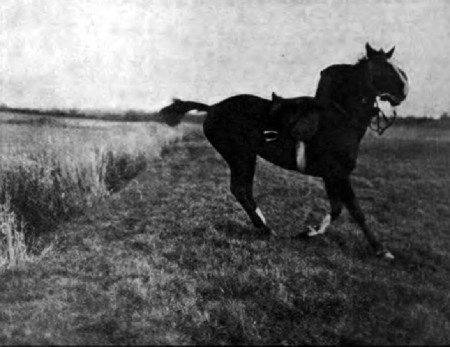 The mare topped it for once, her forefeet caught under a root, and like a flash she was standing on her head. The sudden jerk had doubled me in two across the crutches, and the sensation of her hind-quarters coming over was not pleasant. Out of the corner of my eye I saw a man galloping back towards us. When you are having an accident it is extraordinary how long it seems to take, while really all is over in a few seconds. On this occasion I quite thought it was all up with both of us, but at the critical moment the root gave way, her legs slipped on, and we righted, the man imploring me to sell “that dangerous brute”; but I think very few horses would have recovered from the position we were in. 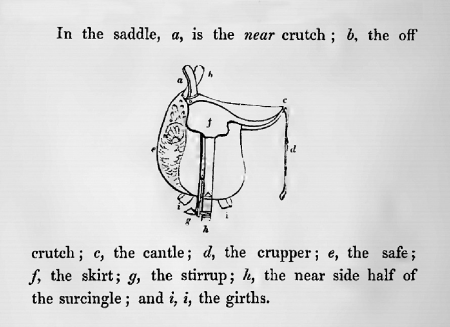 Certainly side saddles are cruel inventions, both for the horse and rider, and I hope in some enlightened age they will be consigned to museums. 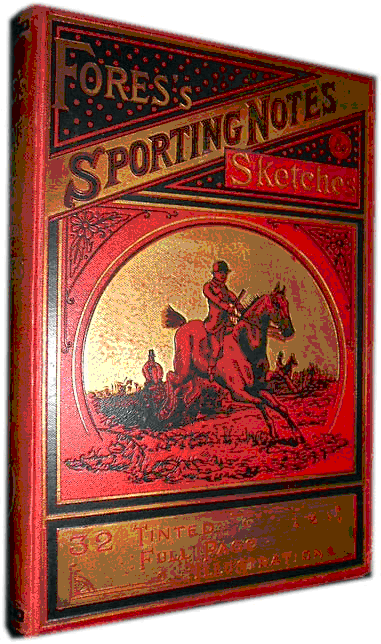 It is, after all, merely a matter of fashion, and if the right set of ladies would show their common sense by adopting men’s saddles it would become the rule and not the exception to see Ladies riding astride. If anyone wishes to practise my methods of falling, I would respectfully suggest a dummy horse, and something soft to fall on. It might not be so comfortable in the hunting field, and few people can spare the proverbial nine lives, which in my case are multiplied by an indefinite number of 000’s. 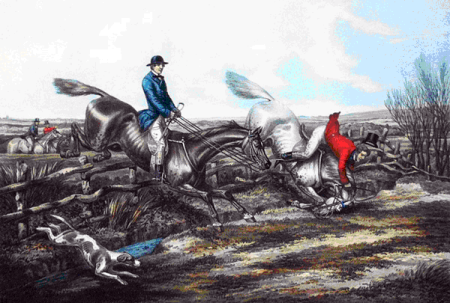 Laois was shired to the English crown in 1556 by Queen Mary and renamed “Queen’s County”. The principal town was renamed Maryborough. The county was retitled Laois after Independence in 1922, and Maryborough became Portlaoise. “King’s County”, now Co. Offaly, was created in the same year for the Queen’s husband Philip. These seven illustrations showing riders parting company with their hunters are from Fore’s Sporting Notes and Sketches, Alken Forres Hunting Sketches and James Pollard.